I went to a French film in Paris. It was a very odd experience. I didn’t understand the plot and unfortunately, they had no English subtitles so I found myself guessing throughout the movie. In truth, French Cinema is very strange compared to what I am used to. Even the atmosphere of a theater in Paris has a strange feel to it. Today I woke up with the number one goal of walking to the Eiffel Tower, a formidable feat from my hostel on Crimée Street. Now, I realize that you are probably asking, “Why walk?”. The answer is simple. There is no better way to get a feel for a city and culture than by walking it. So I wake up early and begin my leisurely stroll through the quiet cobblestone streets and tiny alleyways. The scent of world-renowned fresh bread and doughy pastries fills the air, instantly sending hunger pains into my stomach. I step into the first open cafe and order a frothy cappuccino and delicious chocolate filled croissant; a breakfast meant for savoring. Eventually, the urge to beat the massive crowds spurs my feet into action, and I start walking until I reach the river, Seine. 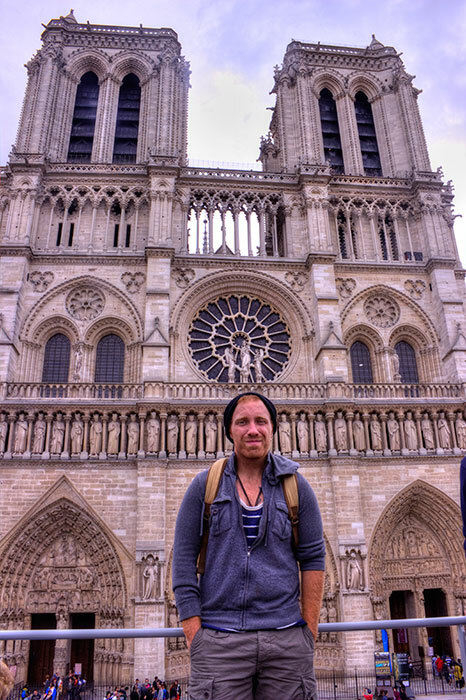 Following the river, I am soon greeted by one of my favorite sights in Paris: Notre Dame. This gothic cathedral is a marvel, towering over every building in the area. Every time I am in Paris, I happily get stuck at this wonderful monument. Each time I visit, my mind travels back in time to centuries past and all the history that happened here. 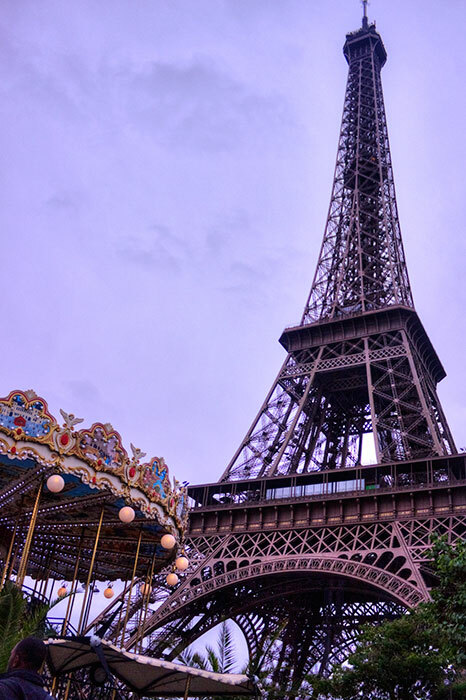 Although I’m eager to get to the Eiffel tower, there are two more stops I can’t pass up on the way. The first is the Shakespeare and Company bookstore, where personal literary heroes of mine including legendary Ernest Hemingway and James Joyce would often gather to sip brandy and discuss life. The next stop is the Louvre and the gorgeous gardens surrounding it. 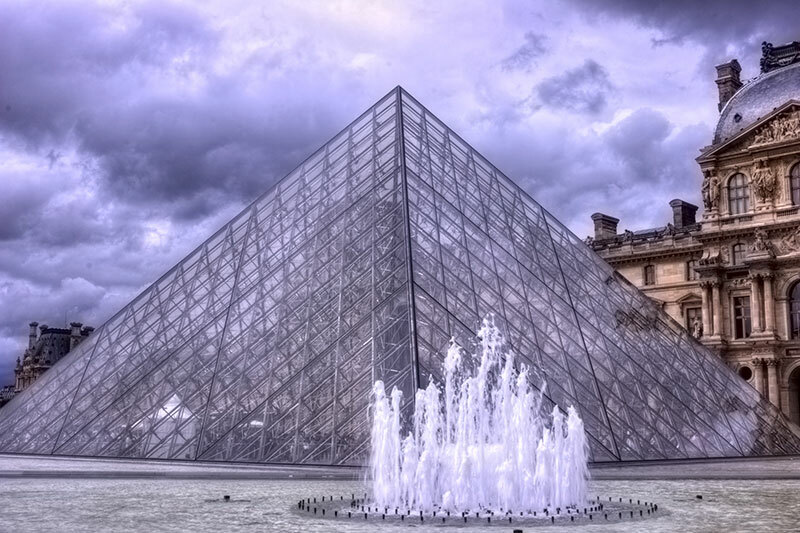 Every time I look at the Pyramide du Louvre, I imagine future travelers visiting this glass pyramid and standing in awe, much the same way I do today as I fly around the globe looking at historical sights such as the Collosuem. 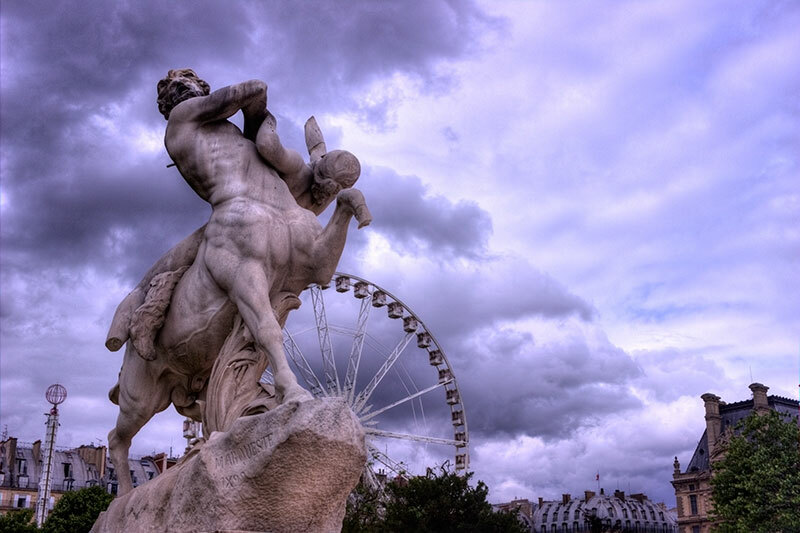 The gardens surrounding the Louvre are filled with Greek statues and modern art. It is a beautiful clash of the ancient with the modern and appeals to the history buff inside of me. I could stay here all day, but I know it is time to move on so I start on the last leg of my journey, an hour walk to the Eiffel Tower. Although I don’t have any other major stops along the way, I do briefly pause to browse the wares in the stalls along the river. Approaching the Eiffel Tower, I can’t help but be impressed once again by its size and beauty. It is the middle of the afternoon now, and while I didn’t make it to the Eiffel tower as early as I planned, I still can’t resist the urge to wait in line to take the elevator to the top. You see, from the top of this beautiful metal wonder, you get an overwhelming view of this grand city. Paris is a city that holds a lot of charm and romance even if you are traveling solo, and I can’t help but visit the city over and over again. It has become like meeting an old friend that I embrace with great fondness every time I visit. Most of the magic that happens while traveling is in the unexpected conversations. Some of the best use no or very little common language and is conducted simply by body motions. Personally, I like eating at hole-in-the-wall diners, shopping at local street stands, and getting off the tourist track. I soon discovered how important it was to know how to communicate without words. The last interesting conversation I had with a local was in a small restaurant in France trying to ask directions. The older gentleman didn’t speak any English and shamefully, I don’t speak any French. Thus, we had about a ten minute conversation that involved me trying to explain where I wanted to go and him drawing me a map covered with French writing. Believe it or not, he was more than willing to help. He laughed a lot, made a few jokes, and wished me well all through body language. I love communicating this way because it shows that language doesn’t have to be a barrier. Locals want you to enjoy their country and even though this man knew I did not understand his words, he found a way to communicate. I walked away smiling; humanity did not disappoint. I cannot tell you how many friends I’ve made in countries all over the globe where I do not know a person’s name. I do not know if they are married, have kids, or what they do for a living; however, I do know their kindness and their character because they have helped me when I needed it the most without a second thought. Traveling shows you the goodness of people despite language barriers and culture differences. Paris isn’t about the sights. It is about the food, the people, and the wine. 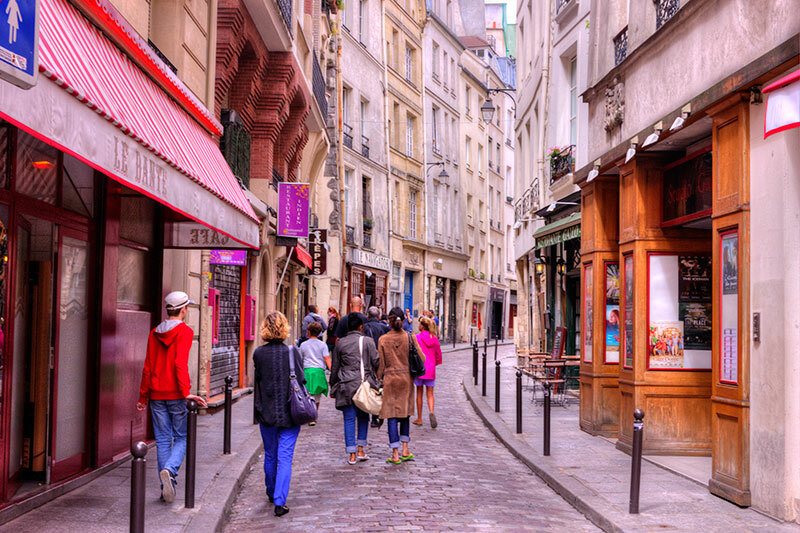 Things I like about Paris are strolling the streets, shopping at the stands, sitting in coffee houses, and kicking back with the locals. One thing I hated at first, but now enjoy, is the rude waiters. Paris is known for its rude waiters, something I didn’t know at first and found rather confusing. Soon though, I realized that it is just part of the culture and now I just smile when I experience it. What was your latest challenge? This wasn’t my latest challenge but one worth mentioning since it involves Paris. In all honesty, the first time I visited Paris was horrible. I showed up on a late night bus in a bad part of town with no place to sleep and nowhere to go during one of the most chaotic times for the city. Luckily it all worked out, but the first few days where rough. Plus, it was my birthday and after the first night, I felt like I wanted to be anywhere but Paris. It took me a while to feel out what the city was about. Of course, once I did, I fell in love. What new lessons has Paris taught you? Paris has taught me a few things. One being to always book accommodations ahead of time as it is a massive travel hub for the UK and Europe. Many hostels are booked out all year round. Travelers should book accommodations a least a month in advance or might risk taking a train to the airport just to get a safe night’s sleep. Take my advice; I have done that on more than one occasion and it is an experience I don’t want to repeat. Next I am headed to my all time favorite country in the world, Italy. I am a history buff and what better place to visit than a country that was the center of the world for two thousand years. Stephen is a long-term traveler and city wanderer You can check out more of his musing of life on the road at his website A Backpackers Tale, Facebook, and Pinterest.